Junckers HIGH PERFORMANCE FRICTION+ is a low-odour, hard-wearing water-based polyurethane lacquer where a high level of slip resistance is required. Junckers HIGH PERFORMANCE FRICTION+ has a textured surface and is very suitable for fitness/aerobic centres, bars, restaurants etc., where sweat, beer spillage etc. can make the floor temporarily slippery, until it is cleaned after use. The product is tested to BS5796-2 and has a low potential for slip under wet conditions. The lacquer is not recommended for sport purposes with player contact, without the use of mats. Junckers HIGH PERFORMANCE FRICTION + should only be used as the final coat in a system. 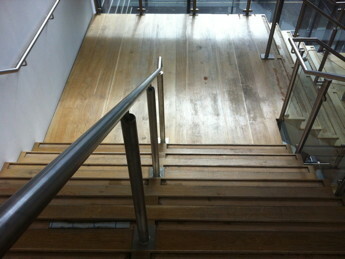 We have used this excellent product on a large scale project we undertook at Liverpool Community College, where we restored 4 separate large stair cases, which even though the college has only been open for 9 months, the staircase treads had worn badly due to very heavy usage, many treads being virtually bare with no seal on them. All the stair cases were pretty much the same in design and structure, the treads were solid oak, coming in just under 3 metres in width, by a depth of 280mm, there were two solid oak half landings [9.5m2 each] on each stair case, these were also restored. The brief for the project was to restore all the stair cases, and apply as good and as hard wearing a lacquer system as possible, as the stair cases were subject to high foot traffic most of the day. We recommended a high quality 4 coat lacquer system from Junckers, with the top coat being HP FRICTION+ to give each tread maximum protection and also excellent slip resistance properties for the many hundreds of pairs of feet going up and down the stairs on a daily basis. Although we have been using Junckers lacquers for many years, using just about their whole product range on various projects over time, we had never used FRICTION+ before on any of our projects, but being a Junckers product you just know its going to be high quality, and we certainly weren't disappointed in that respect. After we had sanded off the old seal and properly prepared each tread and half landing, we applied the four coat commercial lacquer system to each stair case, the lacquer system in this case was 1 x coat of Junckers Prelak, 2 x coats of Junckers HP Sport, and 1 x coat of Junckers HP FRICTION+. 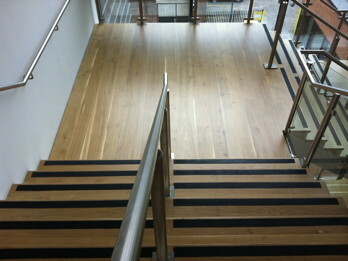 The finished stair cases really did look superb when finished, but with the considerable added benefit of the Junckers HP FRICTION+ which gives much more grip and traction than a standard high quality commercial lacquer, such as Junckers HP Sport or Junckers HP Commercial. Applying the Junckers HP FRICTION+ to the staircases was particularly easy, it was exactly the same as using any other Junckers water based lacquer, no difference in the application or methods at all, in fact you couldn't tell the difference between HP Sport and HP FRICTION+ when the products were poured out. We applied the lacquers with a 4" foam roller for the treads and for cutting in, and a 12" medium pile roller to apply the seal and lacquer coatings to the half landings. We found the drying times for Junckers HP FRICTION+ to be good as well, although it was a warm building so that would of contributed to the 2 hour product drying time in this instance for this product. The coverage rate for the product was exactly as the manufacturer recommended, around the 10-12m2 per litre of product. Aesthetically the Ultra matt sheen level did look very good indeed on the Oak, but when you rubbed your hands over the finish [when dry of course] you can indeed feel the difference, the finish isn't smooth, but at the same time it isn't overly textured either...it felt absolutely right for this particular situation where maximum slip resistance and grip will be needed at all times, whether climbing up - or down the flights of stairs. All the works we undertook were finished exactly to the given work schedule time frame for each staircase, our clients were very pleased with the aesthetic look of the finished staircases and also the high quality of the works. *NB* Woodfloor-Renovations would like to thank Mr Wayne Haslam from Floorstock for his help and valued technical input on this project. Thanks again Wayne. 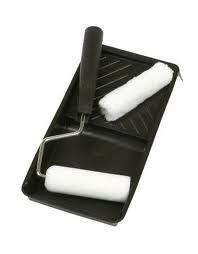 1 or 2 coats Junckers HP Sport 10-12 m2/litre. 2 x coats Junckers HP Sport 10-12 m2/litre. Junckers HP FRICTION+ can be applied to a wood floor in a number of ways, a floor sanding professional will use a variety of application methods depending on the size of project, but if you are looking to apply lacquer to for example a 20m2 lounge, Oak strip, a 9" roller would be perfectly acceptable, the roller refill you need should be a 'medium pile' with the pile length being no longer than 8mm, a decent quality roller will have that information on the packet, use an inch and three quarter roller cage, these are more robust and just better than the cheaper inch and a half alternatives. 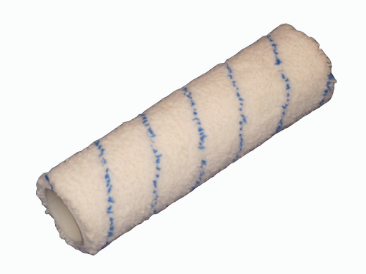 Look out for a light blue line around the roller refill, this designates that the pile has been thermo fused onto the actual roller sleeve and is highly unlikely to shed hair/pile into the lacquer. For cutting in we would recommend using a 4" Mini Paint Roller with a foam refill, these products are cheap but do the job extremely well. You don't always have to buy the manufacturers recommended products, which are normally twice the price of perfectly suitable alternatives. The opinions and views expressed in this article are those of Woodfloor-Renovations through our experiences with the numerous Floor Sanding & Sealing projects that we have undertaken. REMEMBER - ALWAYS follow the manufacturers instructions and read them carefully. If you are not sure about any aspect of this article consult a Professional. The links below are Product Technical information sheets from the Manufacturers and may be of use. They are all PDF Files and clicking on the links will open your computers PDF reading program.